It’s Not a Whodunit. It’s a Whydunit? By Lauren YargerThe biggest mystery surrounding Something’s Afoot isn’t who’s murdering guests at a posh estate on a remote island. It’s why Goodspeed would decide to present a revival of such a flawed musical when there are so many other more deserving shows out there. It’s not a whodunit. It’s a whydunit? 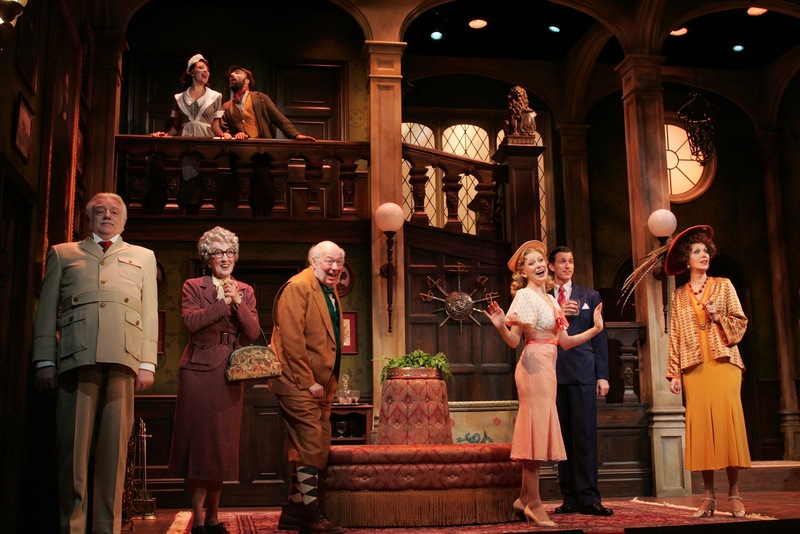 The musical Something’s Afoot originally was produced at the Goodspeed Opera House in 1973. It later opened on Broadway in 1976 and closed after 61 performances (critics haven’t been fans), but in what is really a mystery, it went on to have a run in London where it was nominated for an Olivier Award in 1977. It’s puzzling, since this supposed spoof of Agatha Christie mysteries isn’t very funny and the music and lyrics don’t fit the mood (score, lyrics and the book are credited to James McDonald, David Vos and Robert Gerlach, with additional music by Ed Linderman). This production, conceived by Casey Hushion, but directed by Choreographer Vince Pesce when she had to pull out because of an illness in her family, doesn’t solve the mystery of how to make the show work either. Pregnant pauses wait for punch lines that are dead on arrival; musical numbers go on forever and a character’s cry of “one more time” isn’t exactly welcome. In the middle of the action (and I use the term liberally) actors are singing songs titled “I Don’t Know Why I Trust You (But I Do),” “Dinghy,” and “The Legal Heir” with lyrics like “Pooh, pooh, stiff upper lip,” and “remember Queen Victoria” while unbelievably doing things like whirling about, leaping up on furniture or twirling spears…. Add to these problems the following: ensemble singing that’s off-key; a character actress who shouldn’t be cast in a singing role; an ensemble that doesn’t seem to have come together as one (an understudy went on for one of the leads on opening night); and a still-in-rehearsals feel to a production that’s been running in previews for nearly a month. Now you have a clue as to what the real crime is. But enough said about what doesn’t work. A perfect storm like this is pretty unusual at the Opera House. Let’s just leave it at that and take a quick look at the story and some of the things that do deserve a pat on the back. It’s 1935 (the actors are dressed in stereotypical period costumes by Designer Tracy Christensen) and one by one, guests arriving at the isolated Rancour Retreat (set designer Adrian W. Jones creates a stately mansion) end up dead. The first to go is Clive (Ron Wisniski), so we assume the butler didn’t do it. But who did? Also under suspicion are Lady Grace Marley-Prowe (Lynne Wintersteller, who has a very nice singing voice) and Army Col. Gillweather (Ed Dixon whose humor helps break things up a little). Will amateur detective Miss Tweed (Audrie Neenan) crack the case before the last victim is dragged off to the library? No spoliers here. You’ll just have to find out for yourself. 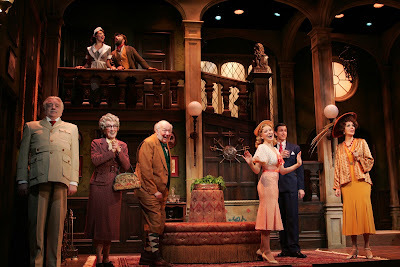 Something's Afoot runs through Dec. 9 at Goodspeed Opera House, 6 Main St., East Haddam. Performances are Wednesday at 2 and 7:30 pm, Thursday at 2* and 7:30 pm; Friday at 8 pm; Saturday at 3 and 8 pm; Sunday at 2 and 6:30 pm* (*Sunday 6:30 through Nov. 4; Thursday 2 pm begins Nov. 8). Tickets range from $35.50-$73.50 (860)-873-8668 or www.goodspeed.org. candy? This frightfully good Halloween special includes a ticket to the evening show and specialty martini for only $46 per person. Food Drive: Monday, Nov. 19. Two-for-one tickets for select seats to the 2 & 7:30 pm performances with a generous non-perishable food donation to benefit the East Haddam Food Bank. Meet the Cast: Take part in a lively discussion with the cast after the Thursday evening performances on Nov. 1, 15 and 29. Meet the Cast events are free with a ticket to that evening’s performance. CT Arts Connections You Should Know! Illusion Aids Magical Evening of HSO Pops!